Stocking up on the Winco PUT-9C Polycarbonate Utility Tong, Clear 9" is a wise and economical investment for your foodservice operation. This polycarbonate tong is sturdy, dishwasher safe and, with its scalloped grip design, can easily grasp all types of food from the hot or cold food bar. 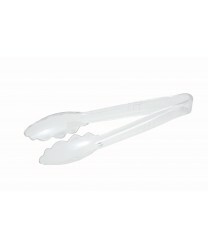 With an attractive clear veneer, and user friendly design, these tongs will come in handy time and again at your salad bar.